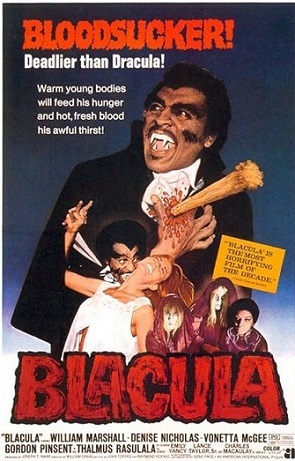 Blacula (1972) -- Full Movie Review! 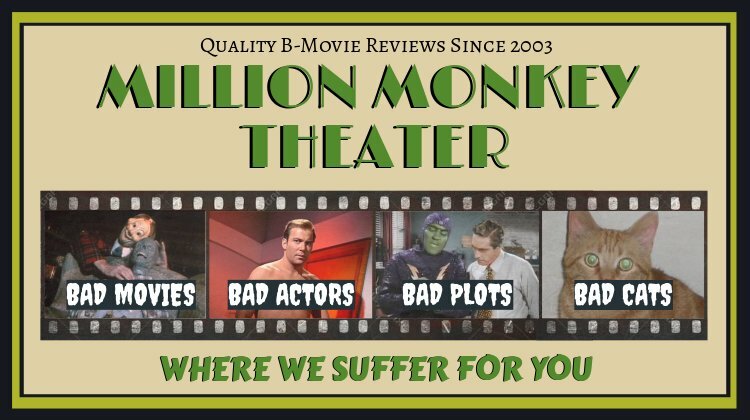 Hi, everybody, it’s Pam, back from a bit of a vacation from bad-movie-reviewing. Hope everybody had a nice summer. Today’s review is of a movie whose reputation suggests it’s perfect MMT fodder, and in fact that’s why I watched it. However, reputations can be wrong, and this movie is an example, so I’m writing this review to give my opinion. 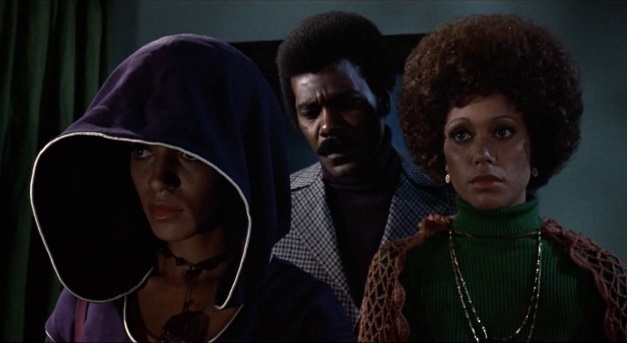 This movie was released in 1972, mostly to negative reviews, and through the years, most reviewers have been critical. I began watching this movie fully convinced it would be as cheesy as the Paul Naschy movies MMT has reviewed. 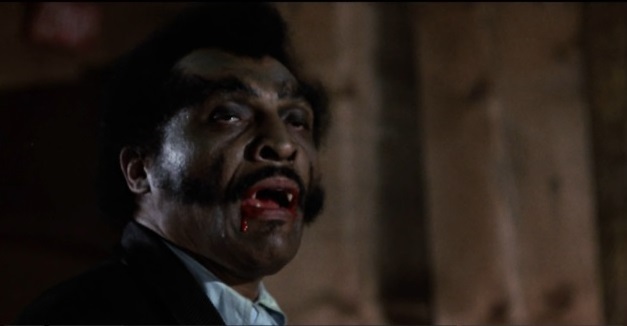 Well, to be honest, the budget for Blacula appears to have been about on the Paul Naschy level, but better use was made of the money for Blacula. 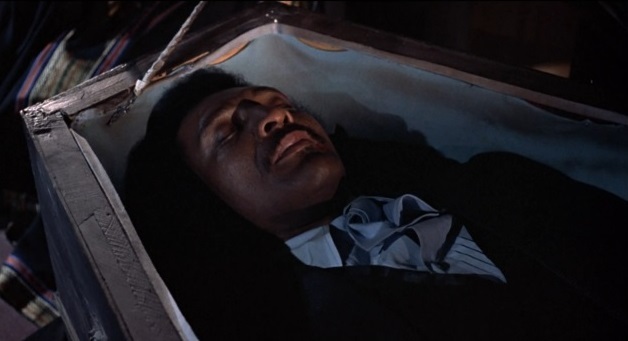 For one thing, the actors in Blacula are actually good, and for another, the plot makes sense. 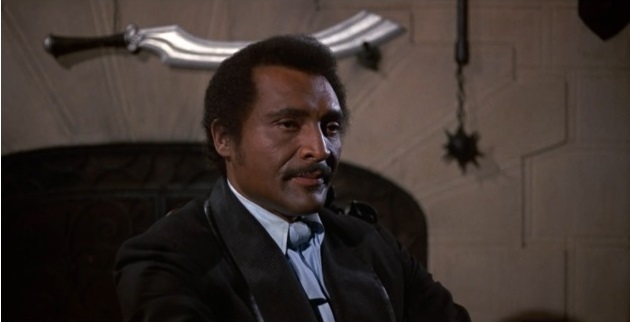 Blacula himself was played by William Marshall, a well-respected actor whose career unfortunately never achieved the heights it could have done because of the prejudices of the time, both of the color of his skin and his politics (he was accused of being a Communist in the 1950s). 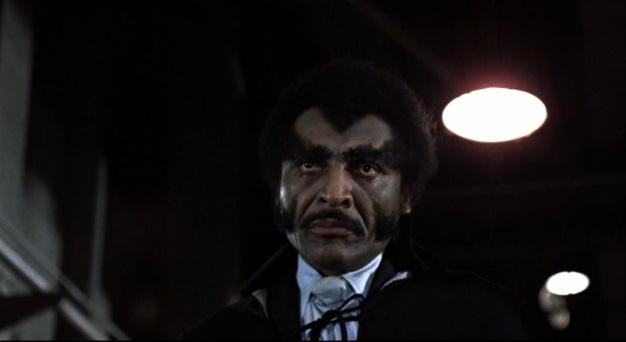 Ya got a little schmutz right there, Blacula. Yeah you got it. Oh, before you watch this movie, there’s something I need to mention. 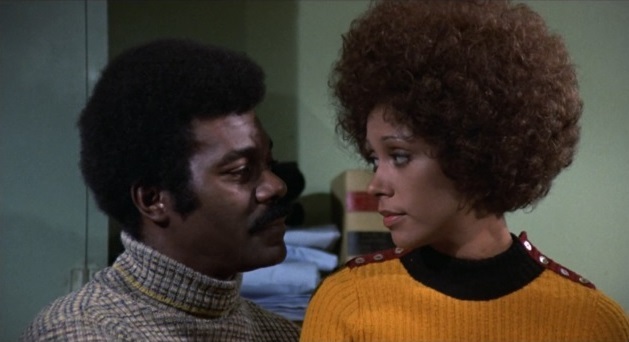 Whites and African-Americans are shown interacting as equals, which doesn’t go without saying in a movie made in 1972. However, gay rights were barely on the horizon in 1972, and there are several unfavorable depictions of homosexual characters, plus some epithets that many today will find offensive. 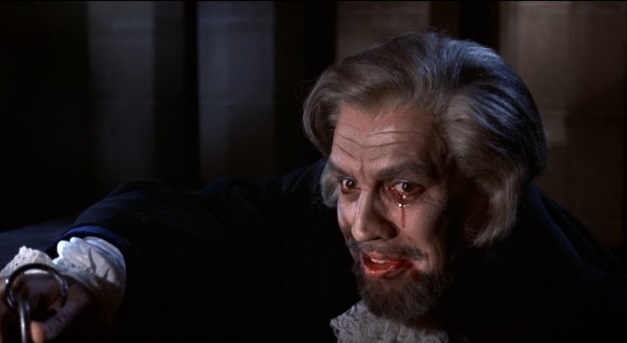 The movie opens with a traditional vampire movie scene: Castle Dracula in what’s supposed to be Transylvania in 1780. The castle architecture doesn’t seem quite right for that part of the world, but since I’m sure the budget didn’t begin to allow for filming in Transylvania, I won’t criticize. And to be honest, I haven’t seen any Transylvanian castles in person, so I could be wrong. 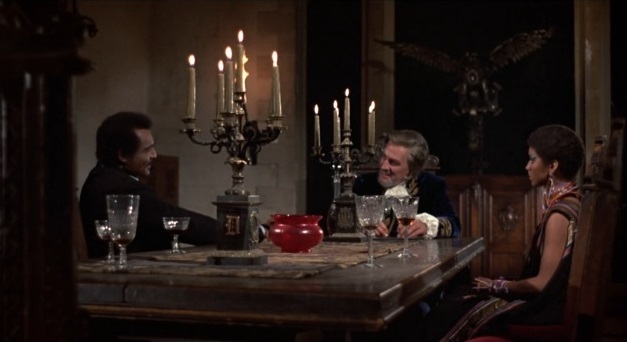 Count Dracula is entertaining distinguished company: an African prince named Mamuwalde, and his wife Luva. What brings an African prince to Transylvania? He’s come on an important mission: he’s meeting with European leaders in an attempt to enlist their help in ending the slave trade. Now here is something of a problem with the movie. Transylvania didn’t have anything to do with the Atlantic slave trade, so why go to see Transylvanian leaders? Again, I’m going to give this a pass, because 1) an African prince probably wouldn’t be 100% familiar with the European end of the slave trade and who ran it, and 2) how else would an African prince get to meet Dracula? The meeting starts out quite civilized, although the Count leers a little too much at Luva. However, the tone deteriorates rapidly and hits rock-bottom when the Count expresses his willingness to buy Luva. Mamuwalde naturally takes exception to this, and he and Luva are on the verge of stalking out, but the Count grabs Luva and orders his servants to capture Mamuwalde. Mamuwalde puts up a good fight but is outnumbered and finally overcome, and the Count tears into Mamuwalde’s throat with more enthusiasm than Bela Lugosi ever showed under similar circumstances. 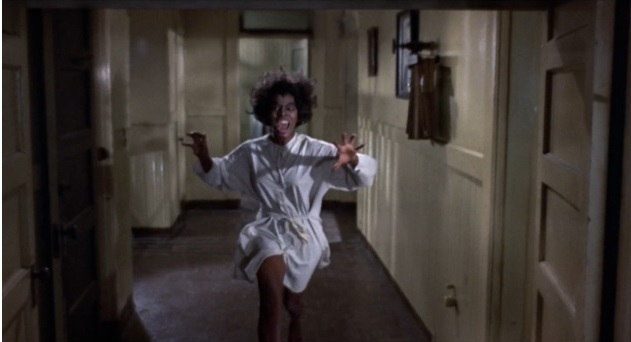 Luva unfortunately behaves like horror-movie heroines were still expected to do in 1972, that is, she stands there cringing and screaming and makes no attempt to fight back. The undead are always creepy. Can a brother get some help here? We now go to the Count’s dungeon, where Mamuwalde now reposes in a coffin. The Count, unlike the always-immaculate Bela Lugosi, has quite a bit of blood around his mouth, and his fangs are prominently on display as he proclaims Mamuwalde will be locked inside the coffin forever, craving blood but never able to get any. 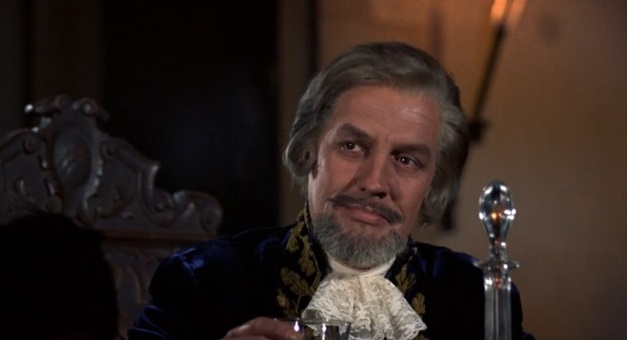 As an aside, Charles Macauley, the actor who plays the Count, does a good job of morphing from poised aristocrat to leering lecher to bloody monster. As a more flippant aside, does Count Dracula have retractable fangs? There was no sign of them earlier. But to get back to what’s left of the scene, to add to Mamuwalde’s torment, the Count orders Luva to be locked in the dungeon next to her husband’s coffin, to die slowly. A bit snug in there. Making the most of his two days on set. All in all, so far the movie hasn’t broken any new ground in the vampire genre, but it’s a well-done version of a standard vampire movie, with one exception. 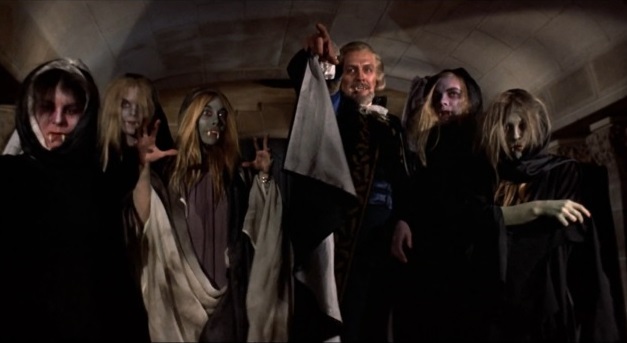 Several of Count Dracula’s undead servants appear to drag Luva to the dungeon, and whoever did their makeup must have thought this movie was supposed to be a comedy. 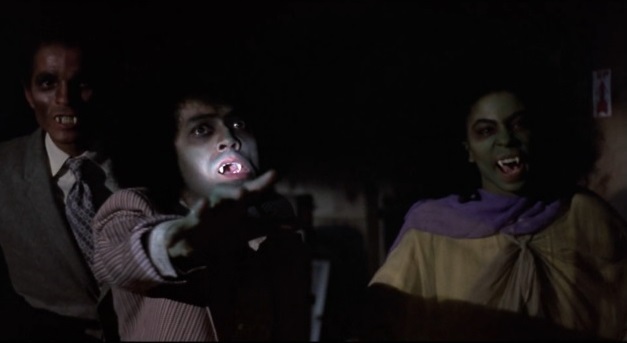 The undead have green and purple makeup and grotesquely exaggerated fangs, and although the actors do their best to be scary, it’s hard not to laugh. Oiy, is the Street Fair in town this weekend? The opening credits come after this scene and they are artsy. Presumably the Count’s threats comes to pass, and the next time we see Castle Dracula, it’s the present day, that is 1972. It seems Dracula ran into some trouble in the early 19th century when Dr. van Helsing destroyed the Count and all his undead companions, so he’s completely out of the picture. It’s not stated what went on with Castle Dracula between then and 1972, but now the castle furnishings are being sold, and two of the buyers are a pair of interior decorators from California. Fast-forward through this if you find gay stereotypes to be offensive. One of the furnishings they find most attractive is the ornate metal coffin in which Mamuwalde is imprisoned. There’s no sign of Luva’s skeleton next to it, but I suppose the Count tidied his dungeon periodically. Once back in California, the castle furnishings, including the coffin, are stored in a warehouse. Unfortunately for them, the two interior decorators want to see inside the coffin, and one of them cuts himself trying to open it. No prize for guessing what happens next – Mamuwalde pushes open the coffin lid while one of the decorators is bandaging his injured partner, and it’s not pretty. Unlike the civilized Bela Lugosi or Jonathan Frid (remember Dark Shadows? ), Mamuwalde attacks like a rabid dog, and both the decorators are killed in short order. Mamuwalde’s vampire side is denoted by long fangs and very thick eyebrows and sideburns, actually very effective at conveying his bestial nature without being too over-the-top. As we will see as the movie progresses, you can judge how safe it is to be around Mamuwalde by the state of his facial hair. Anybody who’s ever seen a vampire movie knows what’s going to happen to the two men Mamuwalde killed. But before it does, something else happens. 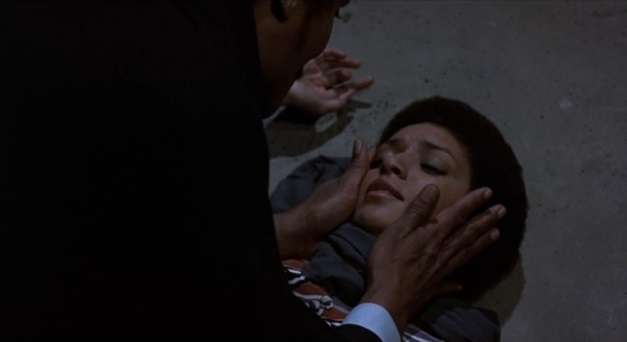 Mamuwalde sneaks into the funeral home to see the corpse of one of his victims, and one of the mourners just happens to be the image of Mamuwalde’s dead wife Luva. Her current name is Tina Williams, and her sister Michelle is dating Dr. Gordon Thomas, who is a pathologist with the Los Angeles Police Department. This is a common motif for this director. Tina (L), Dr. Thomas (C), and Michelle (R). Dr. Thomas isn’t there just to pay his respects to the dead man. The man’s death is considered suspicious, and Dr. Thomas is there to investigate. He pushes past the undertaker to examine the man’s neck, and he finds there’s a flesh-colored bandage stuck on over the wound, which are two neat fang marks. The camera doesn’t get too close, but the undertaker says a big chunk of flesh two or three inches deep was torn out. The undertaker thinks it was a rat bite, but Dr. Thomas is suspicious. Does anybody know if police investigators are allowed to barge into funeral homes and start pulling around bodies that are not only in coffins but are dressed and on display ready for mourners to see them? Nobody noticed that the “dead” man's hand moved? Eh, it's just a flesh wound! 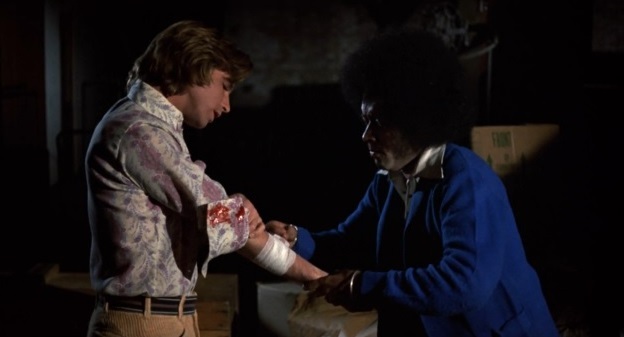 Dr. Thomas also points out that even though the man hasn’t been embalmed, his veins are empty of blood (which isn’t true, the veins on the back of the hand Dr. Thomas isn’t looking at are blue and are standing out, but I suppose the actor was willing to take realism only so far). Meanwhile, Tina and Michelle have left, and Tina starts walking home alone. Her walk isn’t uneventful, since Mamuwalde has followed her and accosts her. The recognition is evidently one-sided, and Tina pulls away and runs home, dropping her purse as she does. (Minor goof: Tina is wearing a necklace with a pendant that varies from hanging outside her clothing to concealed by her clothing from shot to shot, without regard to Tina’s movements.) Tina makes it home safely, but the same can’t be said for a woman cab driver who hits Mamuwalde when he runs out into the street. She stops to see if he’s all right, and he takes the opportunity for a bite to eat. Tina in her apartment, man those spotlights are bright. The cabbie, Yellow Cab's dress standards are somewhat fluid. 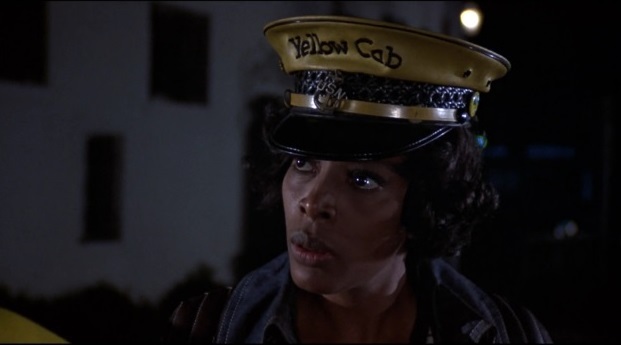 The next morning, Dr. Thomas is sent to examine the body of the cab driver. 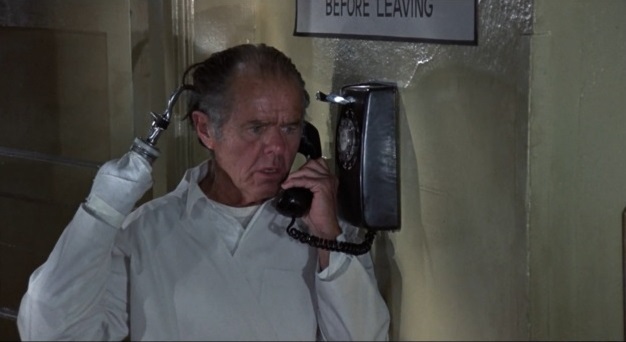 The morgue attendant is played by well-known character actor Elisha Cook Jr., by the way. Dr. Thomas already suspects a vampire is on the loose, and his suspicions intensify when he finds tooth marks on the cab driver’s neck. 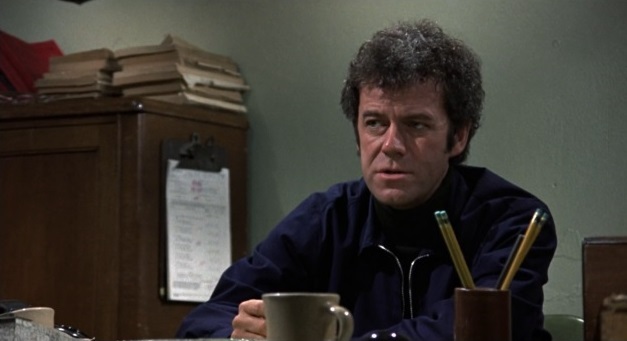 He’s not reassured when Lt. Peters, a police detective, tells him the police reports of the two dead interior decorators have vanished. 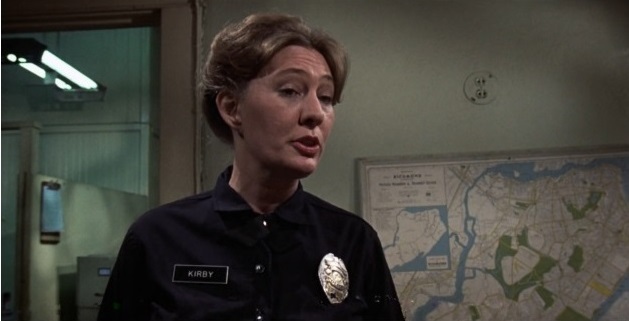 Incidentally, Lt. Peters’ office and the entire police station have a slightly worn, grimy look to them, suggesting that these scenes were filmed in a real police station. 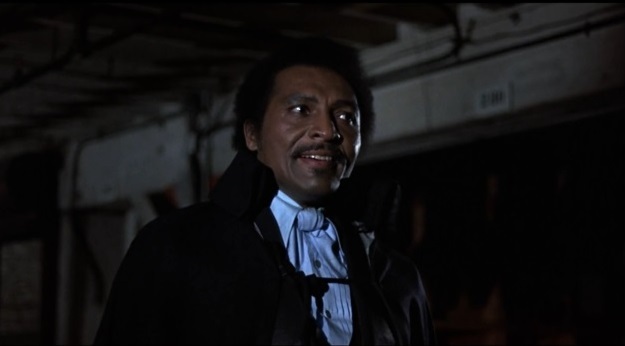 Lt. Peters sends someone to track down the reports, and Dr. Thomas orders autopsies done on the interior decorators and the cab driver. Not much swelling on those bites. 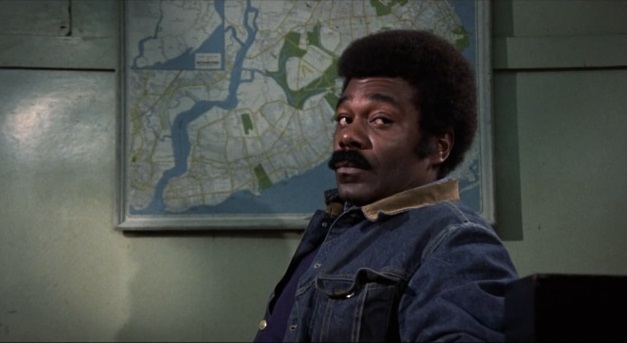 Wait, why does the “LAPD” have a map of Staten Island on their wall? But first, some entertainment! 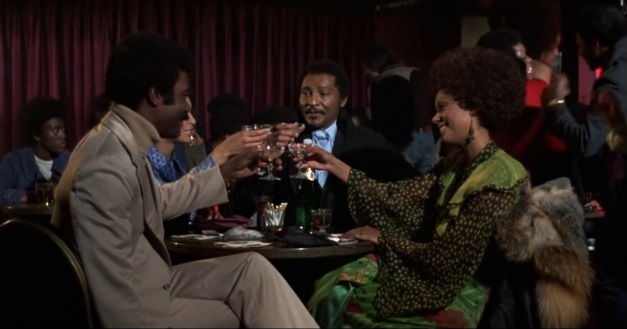 It’s Michelle’s birthday, and Dr. Thomas takes her and Tina to a nightclub. The musical entertainment goes on a little too long (filler? ), but it’s not bad. 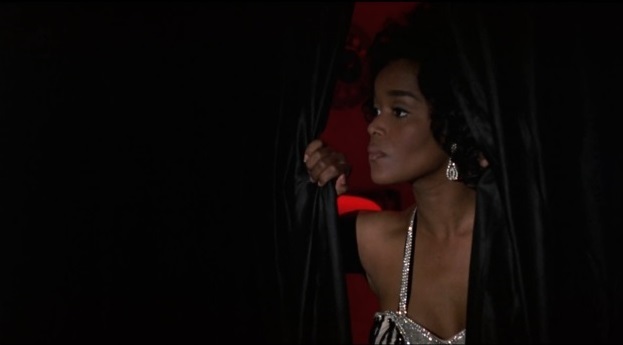 But the important thing about the nightclub scene is that Mamuwalde shows up and gives Tina back her purse. Tina seems remarkably unbothered about how he came by it, especially since she got a good look at the face of the man who accosted her and she should recognize him, but maybe Tina is naïve. 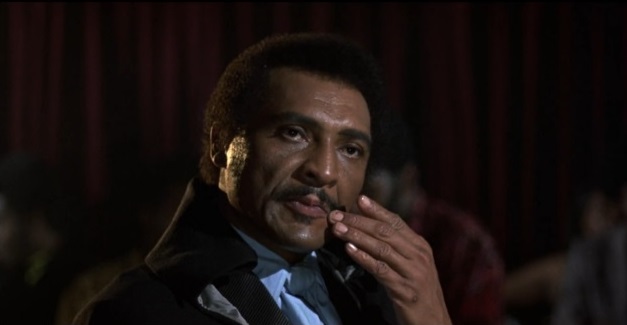 Or it could be because William Marshall was a remarkably handsome man with a voice that was so beautiful it almost didn’t matter what he looked like, and Tina’s better judgment is overruled by the sight of Mamuwalde in his non-vampire state. 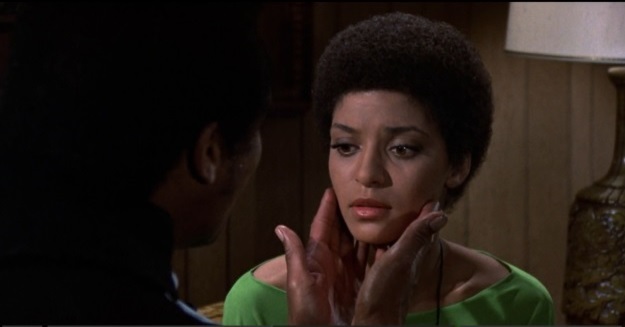 (Vonetta McGee, the actress who played Tina, wasn’t at all hard on the eyes either, and the two of them are top contenders for Best-Looking Vampire Couple In The Movies.) And Mamuwalde is quick to explain that he happened to be at the mortuary when he spotted Tina, noted her resemblance to his late wife, and just had to follow her. He was at the mortuary because he was waiting for the body of the interior decorator to re-animate, but he doesn’t mention that detail to Tina. However, the burgeoning relationship between Mamuwalde and Tina is interrupted when a photographer shows up and starts taking pictures, whereupon Mamuwalde hastens off, but not before the photographer gets a couple of shots of him. They paid to license this song and by god they're going to use it! Always time for some bubbly during a murder spree. But while everybody’s having fun at the nightclub, the undertaker is finding that the body of the interior decorator has disappeared from its coffin. Unfortunately, another body is going to turn up shortly: Mamuwalde follows the photographer home, and just when she’s developed the photos to the point where she can see there’s no Mamuwalde where Mamuwalde should be, he sneaks up behind her and bites her. Again, this is no delicate nipping of the throat. He grabs her and rips at her neck like an animal. And I was wrong when I said “another body” was going to turn up, because it’s actually two bodies. A passing police officer sees the photographer staggering around on her front porch a little later, and when he stops to help, she tears into his neck. So one body is gone, and there are two bodies nobody knows about yet, but what about the body of the second interior decorator? Unfortunately it’s already been buried, and Lt. Peters doesn’t think examining it justifies the trouble of getting permission to exhume it. Dr. Thomas does convince Lt. Peters to ask, but permission is denied. What’s an intrepid vampire hunter to do? If you said, “Go home, get a good night’s sleep, examine the cab driver’s body in the morning, and hope the police find the missing body,” you haven’t watched many vampire movies. 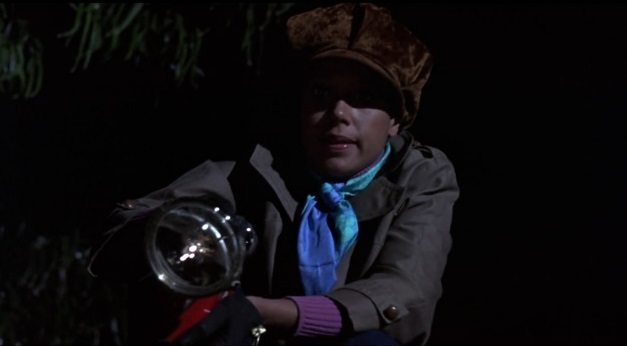 Yes, Dr. Thomas not only gets himself a shovel and heads to the cemetery after dark, he convinces his girlfriend Michelle to help. 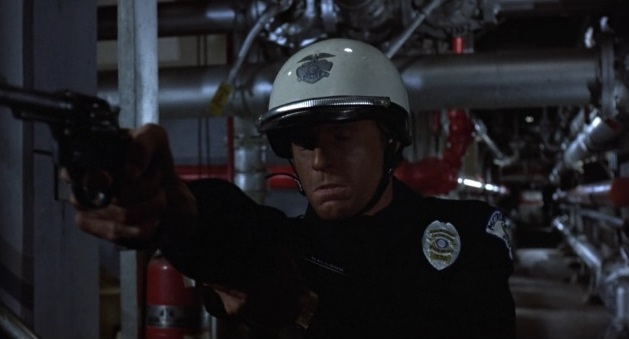 Lt. Peters is Typical Cop Dude. They do make a snuggly couple of HR rule-breakers. But while they’re getting ready to do some digging, who should turn up at Tina’s apartment but Mamuwalde. Tina really should be putting on the brakes here because we’re getting into creepy stalker territory now, but there’s the whole good-looks thing going on, and after all, her sister has just agreed to help her boyfriend dig up a grave, so poor judgment about men seems to run in the Williams family. Rather surprisingly, Mamuwalde tells Tina the truth about what happened to him and what he is now. He asks her to “join him,” but he says he won’t force her. Tina refuses, but she gives the distinct impression she’s considering it, and she’s not bothered by the fact he’s a vampire. Does she perhaps not understand exactly what a vampire is and what it does? Damn girl you gotta get a new couch, that one's fugly. Tenderizing the biting spots for later. While Mamuwalde and Tina are exchanging sweet nothings, Dr. Thomas and Michelle are at the cemetery, digging up the interior decorator’s grave. I’m pleased to see that at least Dr. Thomas is gentleman enough to do all the digging, and all Michelle has to do is hold the light for him. Michelle is in for a bad evening anyway, though, because when Dr. Thomas reaches the coffin and opens it, the interior decorator pops out like a jack-in-the-box and leaps on Dr. Thomas. Fortunately Dr. Thomas has a stake ready, and the interior decorator very shortly is dead for good. So now Dr. Thomas and Michelle know there are vampires on the loose, but how to convince Lt. Peters? The interior decorator’s staked body wasn’t shown, so I don’t know if it crumbled into dust, or if Dr. Thomas decided he just didn’t want to discuss all the details of his “research” with a police officer, but for some reason he feels he needs something else to show to the lieutenant. But you’ll recall there’s another body Dr. Thomas knows about, that of the lady cab driver. Simply love Michelle's plush hat and ascot. Sadly, there’s a problem there, too. Dr. Thomas calls the morgue attendant to have her body out of the freezer and warmed up. He’ll be bringing Lt. Peters, and they’ll both examine the body. He warns the attendant to lock the door of the examining room, but the attendant leaves to take a phone call and forgets about the door. Too bad for him. Once the body warms up, it’s hungry, and the morgue attendant makes a handy snack. Two things we learn here: One, it seems that chilling the body keeps a vampire dormant. Two, lady vampires are modest (she was covered with nothing but a towel when she was taken out of the freezer, but she’d put on a white lab coat by the time she ran out of the examining room and attacked the attendant). 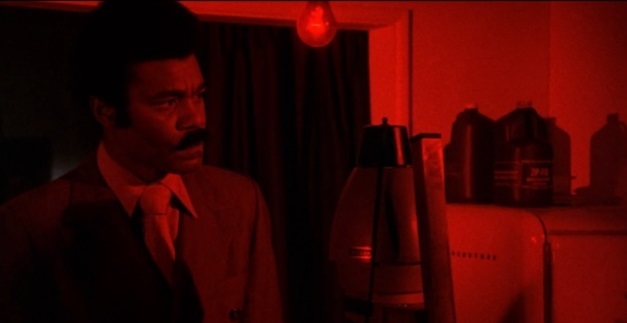 However, Dr. Thomas is still able to show Lt. Peters a vampire. 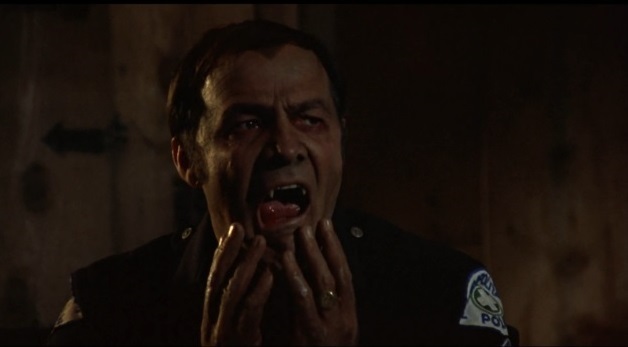 By the time they get there, the morgue attendant is gone, leaving nothing but a lot of blood behind, but the cab driver vampire is still hanging around and attacks them. Fortunately Dr. Thomas thought to come armed with a large cross, and he had the presence of mind to open the window blinds and let the early morning light shine on the vampire, so they escape unhurt. It seems that vampires in this movie have the traditional vulnerability to sunlight. Lt. Peters promises to alert the police to watch for vampires, although I’m not sure if he plans to put it quite that way. Dr. Thomas occupies the early part of that night by taking Michelle and Tina back to the nightclub, where Mamuwalde obligingly turns up. His new rapport with Tina seems to have made Mamuwalde a little giddy. He orders a Bloody Mary with a knowing smirk, and he admits coyly that he finds vampires fascinating when Dr. Thomas turns the conversation to matters of the occult. 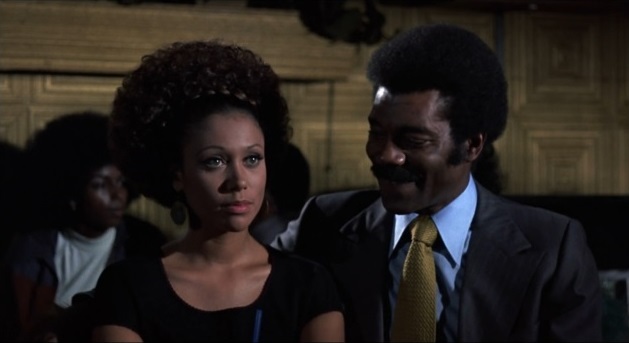 However, he’s not grinning quite as broadly when Dr. Thomas tells him the police are out searching for vampires, and he leads Tina off quickly. Dr. Thomas is given something else to think about when an acquaintance turns up and mentions he hasn’t seen the nightclub photographer lately. No, seriously, is this movie set in LA or New York? Is she wearing a snood? 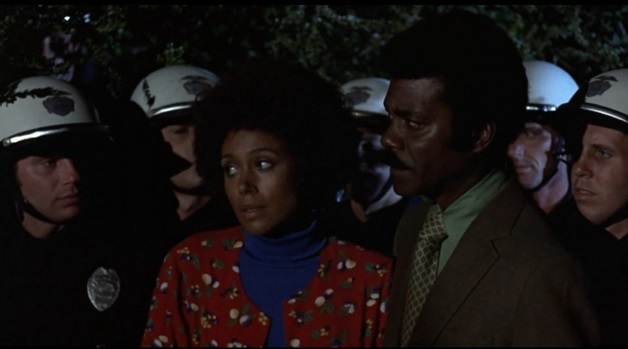 Dr. Thomas goes to her house, and apparently vampire hunters didn’t need search warrants in 1972 Los Angeles, because he goes (breaks?) right in. He finds her darkroom in disarray, as though there had been a struggle there. 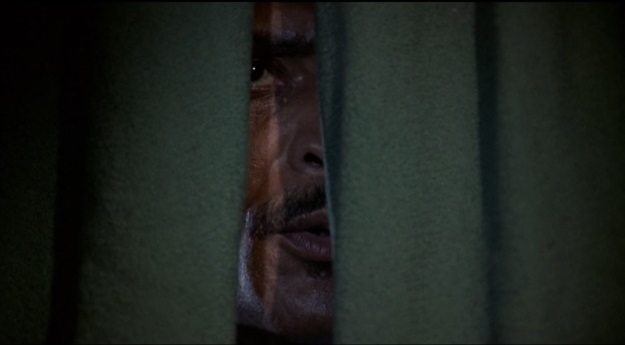 He spots the negative of the shot he knows Mamuwalde should be in but sees he isn’t there, and he starts thinking. He remembers, of course, that Mamuwalde is with Tina, and he goes to Tina’s apartment to check on her. 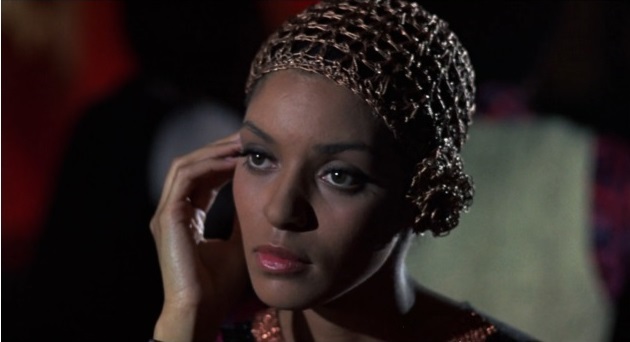 Mamuwalde is there, asking Tina again to come with him, and Tina is looking wistful when Dr. Thomas barges in. Mamuwalde punches Dr. Thomas and escapes, but a police officer sees him running and gives chase. 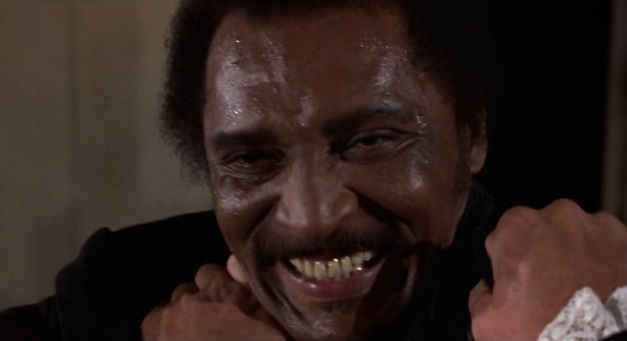 Unfortunately a cop’s gun is no match for a vampire, and although Dr. Thomas appears only moments later, the police officer is dead and Mamuwalde is gone. Ya got a warrant, copper? There's going to be some paperwork now. 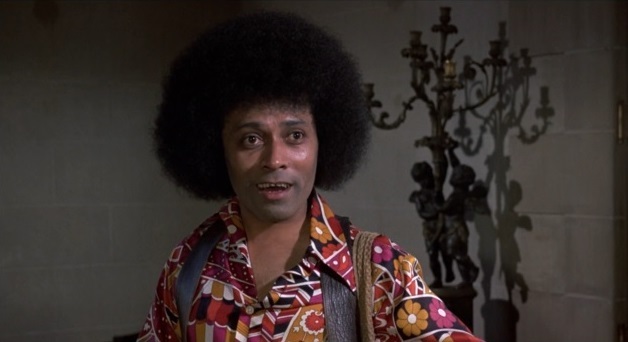 The police don’t spot Mamuwalde, but they do see the missing interior decorator who is in the process of picking up a man, and they notify Lt. Peters. 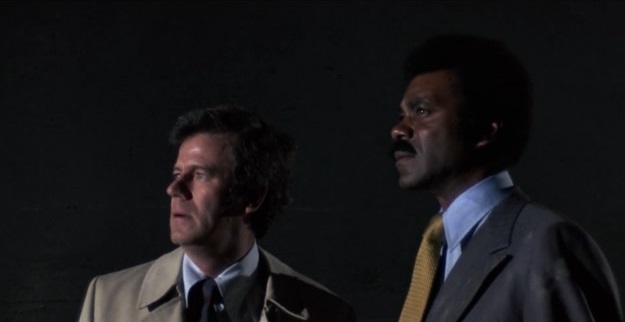 Dr. Thomas and Lt. Peters head out to find him, while Michelle stays home to look after Tina. The interior decorator was near the warehouse where the bodies of the two interior decorators were found, and Lt. Peters orders the police to converge there. 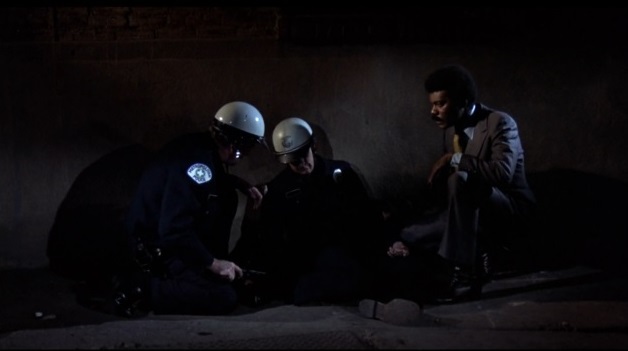 For some reason, only Dr. Thomas, Lt. Peters, an unnamed police officer, and another police officer who turned up unexpectedly actually go in the warehouse, while the rest of the police stay outside. (Spoiler: nobody knows this, but the unexpected police officer is the one who stopped to help the photographer and was attacked by her. He, unlike the rest of the vampires with the exception of Mamuwalde, looks alive.) Sure enough, they find the body of the pickup, and they find multiple vampires, including the interior decorator. For some reason, contrary to the practice we’ve seen the vampires follow before, they don’t leap on their victims but mill around and stare at them, fangs prominently displayed. This would be spookier if the ham-handed makeup artists hadn’t been at work here and again made the vampires look like jokes. Oh ho ho, that's bad. 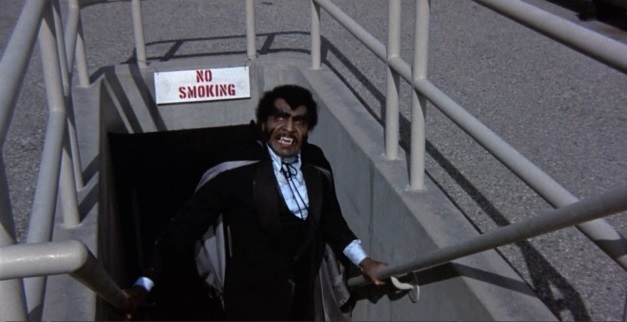 The unnamed cop splits off from Dr. Thomas and Lt. Peters and is quickly brought down by a vampire. It appears that Lt. Peters hasn’t given the rank-and-file police as much information as he should have about the nature of this unique menace, and in fact it looks as though he may not have bothered to tell them anything except to look for some particular individuals on the street. Dr. Thomas and Lt. Peters are greatly outnumbered by the vampires and the unexpected police officer who shortly reveals his true nature. Of course their guns are of no use. Luckily for them, there is a case full of oil lamps handy, presumably part of the interior decorators’ stock in trade. Even luckier, the lamps were put in the case full of oil, and luckiest of all, the unlit oil bursts into flame on impact when the lamps are thrown at the vampires. Did I say “luckiest of all?” No, “luckiest of all” is that the fire from the oil and burning vampires doesn’t spread and ignite the flammable material with which the warehouse is crammed until Lt. Peters and Dr. Thomas subdue all the vampires and escape. 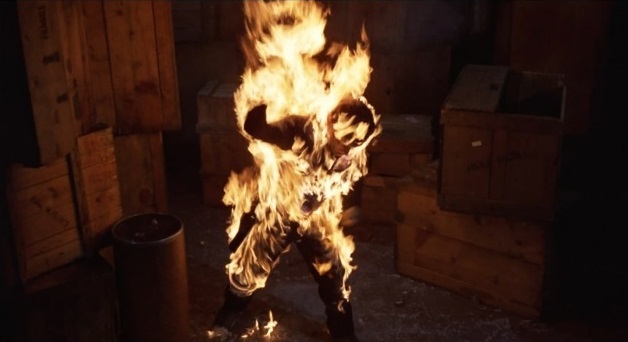 Stuntman on fire! That's half the budget right there. But if they think they’re out of the woods, they’re wrong, because Mamuwalde is outside waiting for them, gloating that he moved his coffin before they showed up. He seems to feel no responsibility toward the vampires he created. It seems to me the smart thing for Mamuwalde to do would have been to leave before they spotted him, or kill them both on the spot if he just had to show off a little, but all he does is explain he has an urgent appointment, turn into a bat, and flap off. Immortal vampires can gloat a bit. Yeah, guys, I know, that bat-change effect was terrible. Of course they know where Mamuwalde is likely to go, and Dr. Thomas goes to Tina’s apartment. 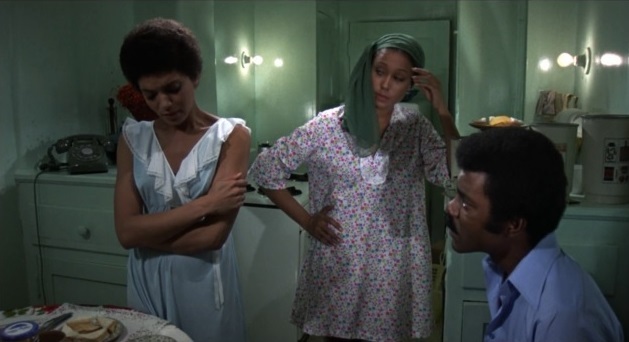 At first all Tina can do is sob, even though Michelle and Dr. Thomas remind her Mamuwalde has killed innocent people, but eventually she agrees to help. The police have sealed off the entire block and are clearing the streets. But the police are no match for a being who can turn into a bat, and also, as we find out for the first time, can communicate telepathically with Tina. He summons her, and she comes to him, despite the promise she just gave. However, she’s missed almost immediately, and the police are notified to look for her. She’s soon spotted, and Dr. Thomas, Lt. Peters, and Michelle go off to intercept her. Family intervention. What's with all the bare lightbulbs? Stupid girl, boys are nothing but trouble. It turns out Mamuwalde has holed up in a chemical plant. The sound of police sirens alerts him, and he takes Tina and tries to escape. They’re spotted by one of the police officers, who opens fire. Of course Mamuwalde is unhurt, but Tina is hit and badly wounded. 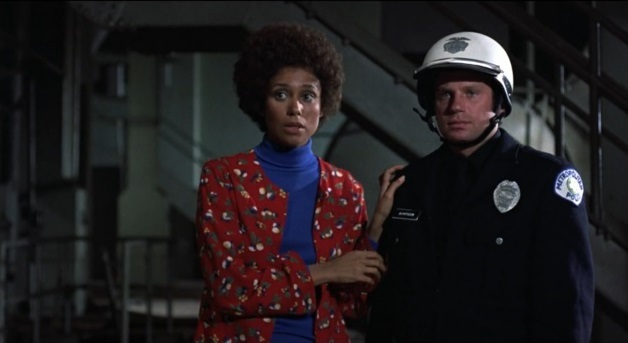 He of course kills the police officer, and feeling that Tina is going to die and he has no choice, he bites Tina. You'd have better aim if you'd open your eyes. I'd rather die a mortal. Dr. Thomas, Lt. Peters, Michelle, and a bunch of redshirt cops are searching the chemical plant when they’re halted by Mamuwalde’s threats echoing through the building. The cops split up, and they aren’t carrying radios so they can’t communicate with each other. Does anybody know if two-way hand-held radios existed in 1972? It seems Lt. Peters didn’t bother to tell his subordinates that bullets won’t kill Mamuwalde, and I guess they weren’t issued with stakes, crosses, or garlic. One by one Mamuwalde picks the police off, although he beats them to death instead of biting them. There’s nothing to suggest why he no longer seems to want to make more vampires. Maybe he wasn’t hungry? Are a pathologist and a lab tech really qualified for this? His Count Chocula widow's peak is distracting. Ouch, that's a rough way to die. Sister's a vampire? She's going to need therapy. Of course her screams bring Mamuwalde, still in full vampire mode, but instead of attacking, he looks sad, kisses her goodbye, and slowly walks up a flight of stairs into open sunlight, where he dies. Dr. Thomas and Lt. Peters arrive to find his rotting head crawling with maggots (genuinely disgusting!) which soon changes to a bare skull. So peace returns to Los Angeles, unless there were some vampires who escaped the fire in the warehouse. Unless you're a cooked vampire amirite? That's a great prop, seriously. 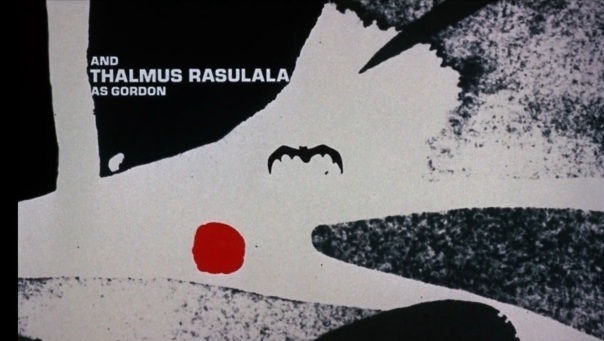 As I said at the beginning, this was a good vampire movie. 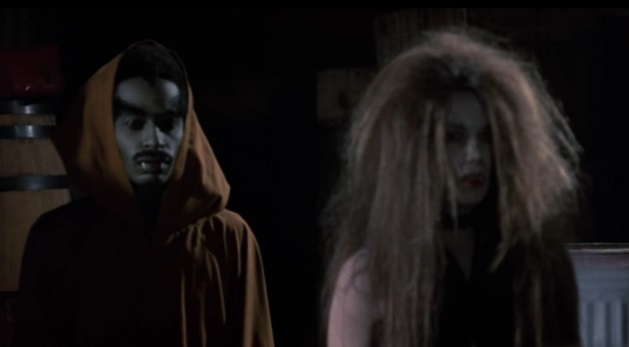 I give it an A-minus, because except for the main vampire being from Africa, it was a stereotypical vampire movie with nothing original about the plot. 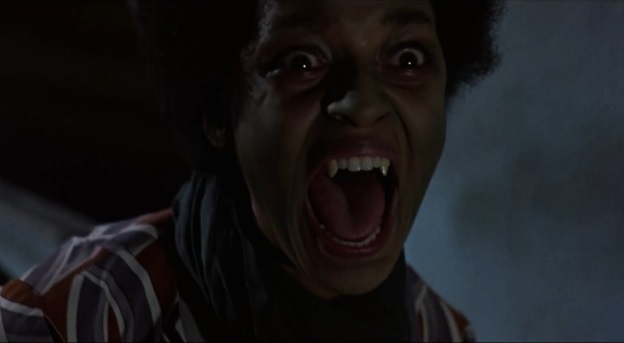 Possibly in 1972, having the main vampire being from Africa was considered enough of a deviation from the standard vampire movie that the filmmakers didn’t want to challenge the moviegoers with a plot that was greatly different, too. 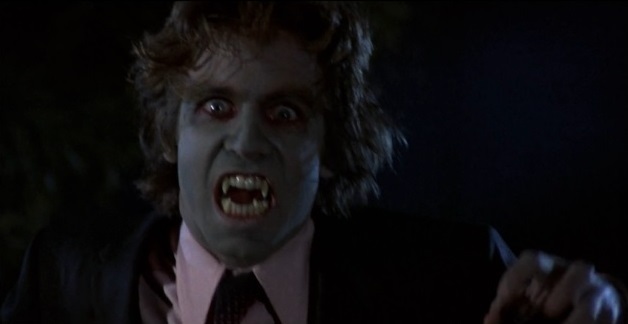 And speaking of standard vampire movies, there are a couple of points I want to bring up about this movie, but which also apply to most other vampire movies. Point one: Don’t vampires smell bad? I would think so, since they never seem to change their clothes, and there must be a lot of dried blood on them. Shouldn’t you be able to smell a vampire, even if you can’t see it? And point two: How is it an African prince, or any other vampire, knows everything about how things work in modern society even though he’s been shut up in a coffin for the last 200 years? Even vampires who can move out of their coffins freely are constrained by the need to be back in before dawn, so how much can they learn about what’s going on in the world? Inquiring minds want to know! 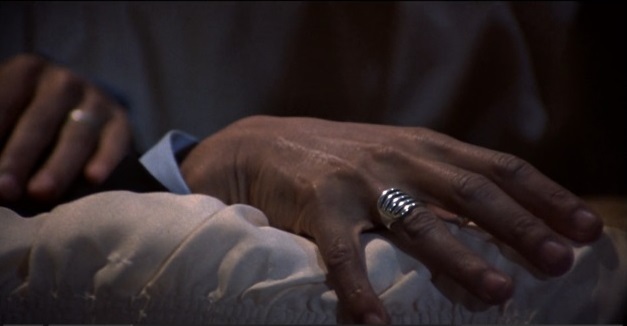 Also, why did the morgue tech have a fake hook hand? Glad they survived, they'll make pretty babies.